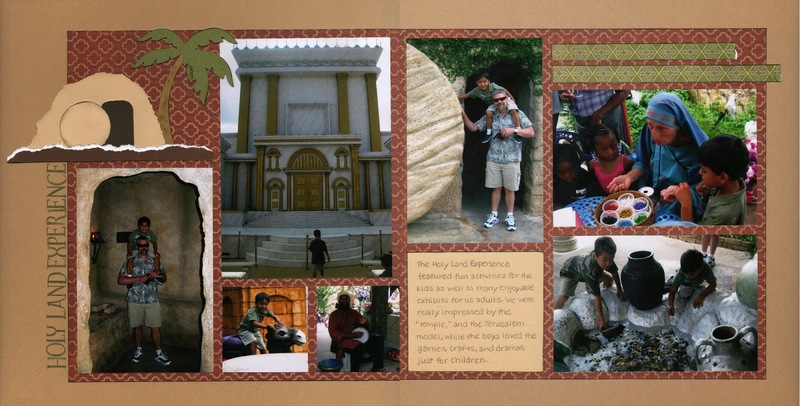 Completed another Holy Land Experience layout today. 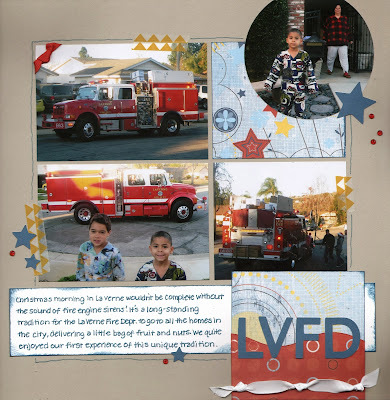 I realize I kept these layouts very simple, but I really couldn't figure out what else to add to complement the photos. On the flip side, the photos are scrapped and in my album, so that's a plus for me! Sometimes I get so caught up in the design that I forget it's okay not to add the kitchen sink to my layout, if you know what I mean. 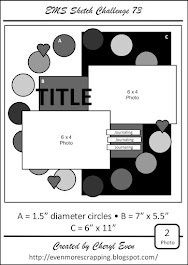 Looking back at even the simplest of layouts will bring back memories, and that's what counts. I've been meaning to play along with the 5th Week Challenge on Splitcoast Stampers and finally got my act together to do so! 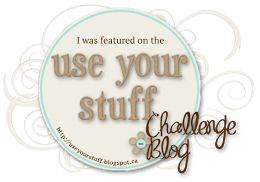 This challenge is posted whenever there is a fifth week (M-F) in the month, and the December one combined a sketch, a Variety Challenge, and a twist (use a stamped image). I had to put my thinking cap to get all three in one layout, but I managed it! 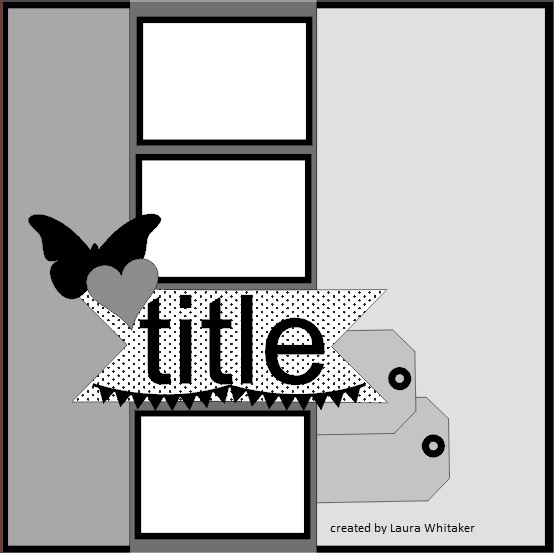 I cut the title using my Cricut and two photos. I had never cut photos on my Cricut before, and I was surprised how easy it was - no slipping or ragged edges. 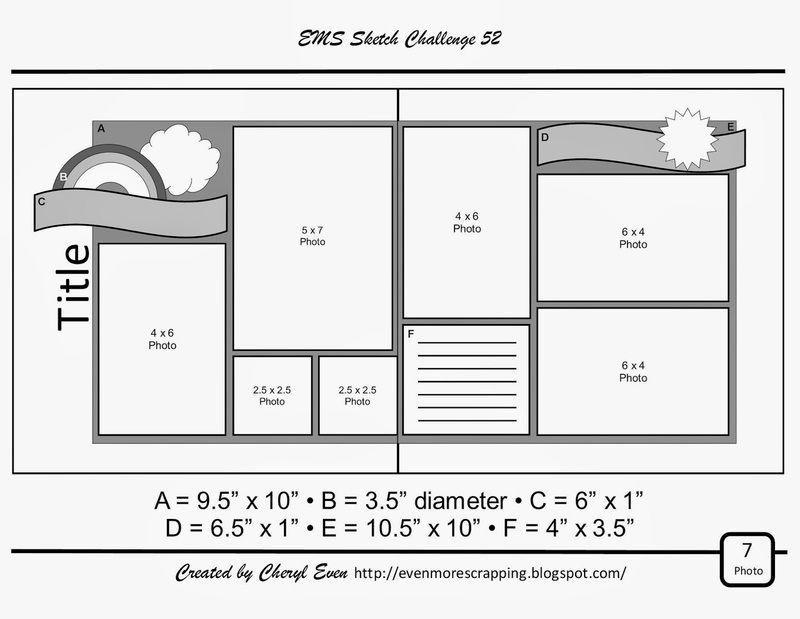 It's time for a Variety Challenge over at Splitcoast Stampers, and I'm so excited to be hosting the 200th challenge! Who wants to celebrate with me? Join in the fun by playing along with our challenge using the link below. For today's challenge, I want you to use stamps, markers, die-cuts, your computer, etc. 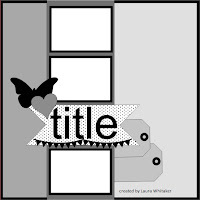 to create a title or journaling spot on your layout. Sound easy? But there's a catch: you have to either use at least three fonts, or intersperse symbols or pictographs amid your regular fonts. If you are creating your title or journaling by hand, you can use cursive, printing, all caps, or outlined letters (just to name a few ideas) to get the look of various fonts. I decided to use both options, so I added some pictures to my hand written journaling, plus I used Tiny Typewriter, Polka Dot Alphabet & Felicity stamp sets to create the title. I always struggle coming up with titles for birthday layouts (how many times can you use Let Them Eat Cake?) so the title is a play on Michael Crichton's book "Eaters of the Dead." My Babycakes card workshop is tonight, so I wanted to show off a few more of the cards I created. I'm still trying for a non-baby look for this set of cards, and I think I succeeded on this one. I also discovered that if you stamp on seam-binding ribbon, it looks pretty distinct at first, but by the next day, it pretty much bleeds together and you end up with a vintage looking ribbon. Not exactly what I was going for, but I can live with it! My 22nd wedding anniversary is this weekend, and my husband is going to be out of town. I wanted him to have something special on the day of our anniversary, so I made a card this afternoon and slipped it into his suitcase! I was treading the fine line between showing him how much I love him and not wanting him to be embarrassed if he opens the envelope while a bunch of guys are standing around, so hopefully this card strikes that perfect balance. I am a pretty simple scrapper, but I always envy those who can layer multiple items on a layout without it looking messy or distracting from the pictures. Well, I decided to try some layering, since it's the new year and it's a great time to try new things, right? I went a little die-cut crazy and probably wore my poor Cricut out (at least for the morning! ), but I like the result. I still kept it simple in terms of patterns, but hopefully that will be something to work on as the year progresses. Let me know what you think! 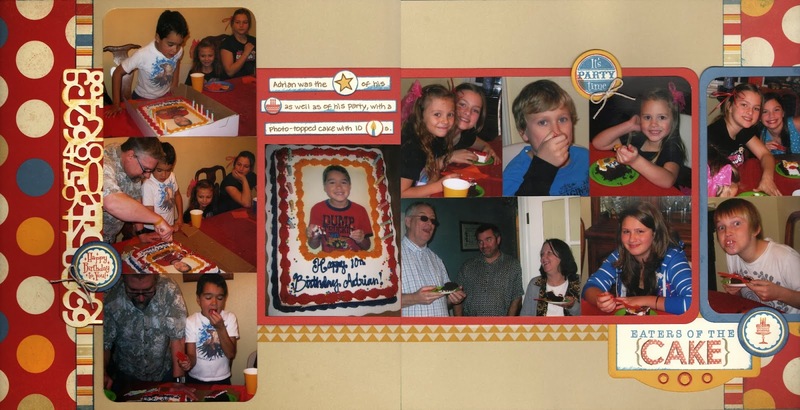 So I have to ask myself, will my son will ever forgive me for using so much pink on a layout celebrating his tenth birthday? Especially considering he had a Lego party! I really, truly wanted to go with a different color scheme, but three gals came to the party wearing pink, so what's a scrapbooking mama to do? Oh well, hopefully the aqua and yellow will balance it all out in his mind. I love the ladies in my card-making club, but they frequently challenge me, as in the case of the Babycakes paper pack! My mission, should I choose to accept it: take a baby themed paper pack and create non-baby themed cards. I love a challenge, so with help from a sketch by Stuck Sketches, I got to work. 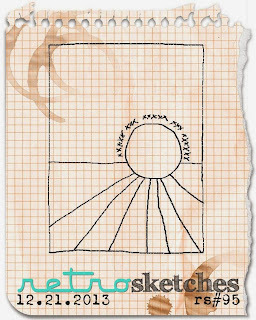 Although this is a layout sketch (and I will probably use it as such later this month), Frosted Designs is partnering with Stuck Sketches and wanted to see layouts or cards, so I turned it into a card. The Chocolate squares are actually leftover pieces from the window on this card (see the second card in this post), and I had saved them, hoping to use them this month. I tried to include the tags that are on the sketch, but the card was just too small. Any thoughts on the butterfly? Is it too random or should I leave it as is? Since I will be having about ten ladies at the workshop, and cutting a bunch of little pieces at a diagonal sounded like a big pain, I decided to stamp the bottom half of the card. I was inspired by this card, but used a new stamp set called One-Way Borders to stamp all the arrows. Popped up the center sentiment and added a bow, and it's done. Simple but I hope my ladies will like it! • Corner punch or embellishment (this one had me puzzled until I got the idea to embellish a corner with knotted ribbon). Thanks for a fun challenge, Lela! And everyone else, feel free to play along by clicking on the link above. 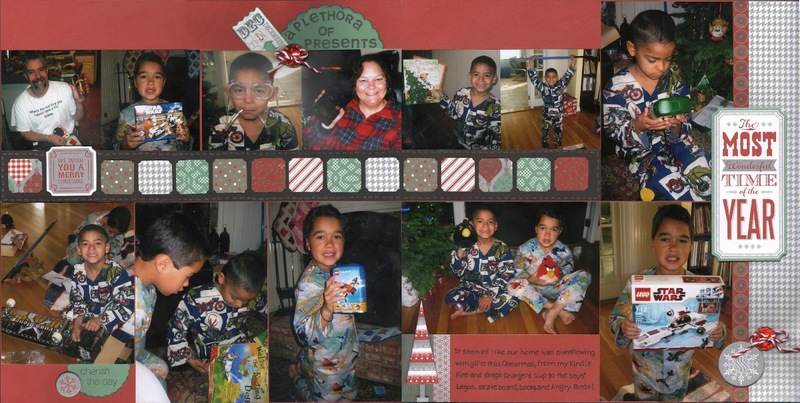 In case anyone is wondering, plethora means abundance or excess, which was certainly appropriate for the Christmas morning depicted in this layout. 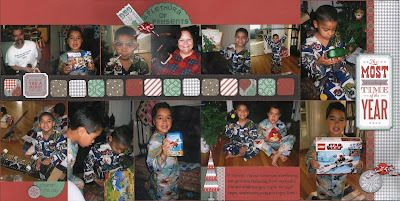 Our kids have lots of grandparents, so they received lots of presents! 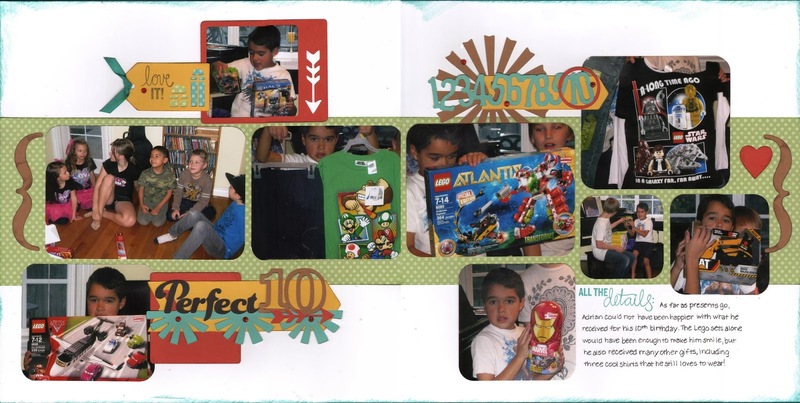 This was my last layout of 2013, and I am so excited that I met my yearly goal of 100 layout. Woohoo! Now I need to get started on my 2014 goal. Update: I was a winner at Color My Heart for this layout! Happy New Year, everyone! Welcome to the first EMS sketch of 2014. 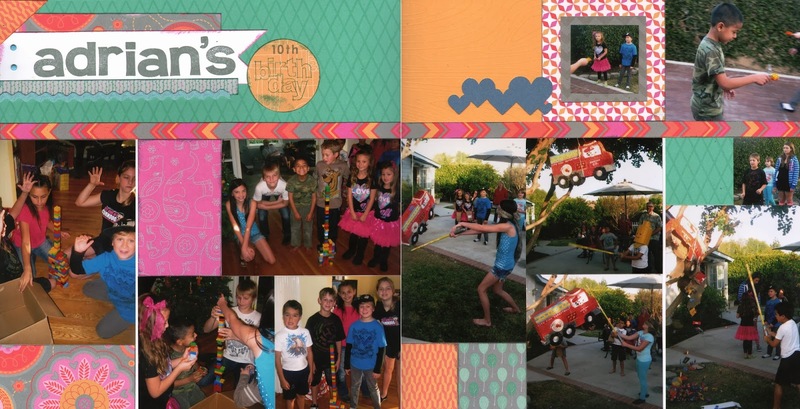 If one of your goals for this year is to get some scrapbooking done, you've come to the right place for inspiration. This month's sketch features 7 photos in an assortment of sizes, but feel free to change them up to whatever works with your photos. 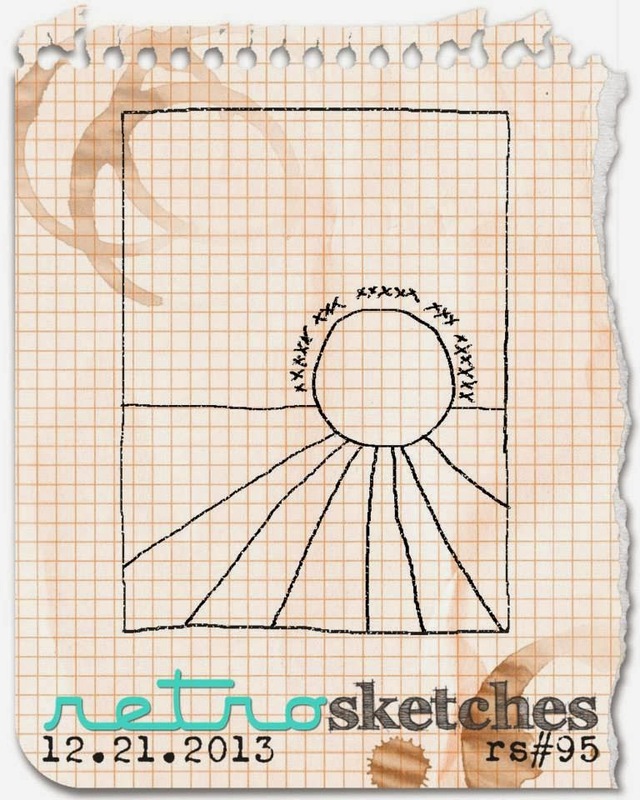 You have until January 31st to create a layout based on the sketch, post it online, and then link to this post. I will choose one scrapper's layout to be featured on my blog on February 5th, and that person will be invited to be a guest designer for the following month's sketch. Let's see what you can do! Check out what guest designer Amanda has done with the sketch; she stuck with the original structure but adapted a few of the picture sizes, plus she took advantage of the banner areas to create little scenes that reinforced the theme of her layout. Thanks for sharing this darling layout with us, Amanda. 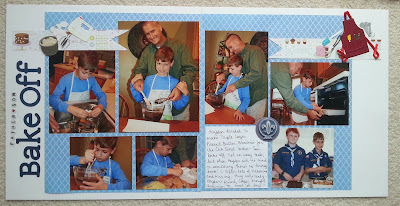 If you want to see more of Amanda's work, check out her Splitcoast Stampers gallery! Please link your completed layout here by 1/31/14 at 11:59 pm PST!